Sailing clothing needs to keep you warm. Keeping dry is less important. Although if you continue to sail you will want to buy purpose designed sailing clothing this can be expensive and is not necessary to begin with. Head A hat is essential. Baseball cap or woolly hat. You lose a lot of body heat through your uncovered areas of the body whilst sailing – and the head is a fairly big area if uncovered!. Lower body Warm trousers e.g. cords, track suit bottoms are preferable to jeans. You need a good belt / means of holding them up. Moving around the boat tends to lower them! Feet Old trainers with socks or thermal socks. Your feet will get wet. Please do not wear Wellingtons or hard sole shoes.Wellingtons fill up and hard shoes can damage the boats. Dinghy boots or wetboots are the next step up. Waterproofs If you have a waterproof cagoule or trousers please bring them. The club has a limited supply which we can lend you. Bouyancy Aids The club will supply you with a buoyancy aid which must be worn at all times on the water. 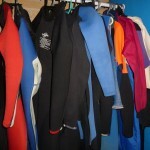 Wetsuits If you have or can borrow a 3mm or 4 mm sailing/surfing wetsuit then it is sensible to wear it. (Diving wetsuits are too thick and restrict movement too much.) The club have a number which you can borrow but there may not be sufficient or one of a suitable size for you. Wear a thermal or synthetic material long sleeve shirt underneath if possible ; cotton t shirts are very cold when wet. You should still bring warm clothing to wear over the top as wetsuits only stay warm whilst you are moving around. Wetsuits can be hired from a surfing shop in Tynemouth. 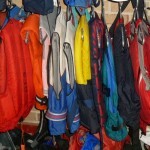 Drysuits The ultimate stay warm and dry sailing gear. If you happen to have one or can borrow one then bring it, with warm clothing to go underneath and boots/trainers to go over the feet. Change of Clothes We will do our very best not to capsize you when you first start sailing but if it’s windy you can get pretty wet just from spray. Make sure you have a complete change of clothes. Towel Don’t forget it ! We have hot showers renovated in 2014 – and they are awesome. In fact at one point they were so powerful they pushed the shower heads off so we had to turn them down.